Now I’ve always liked good old peanut butter, but my Irishman is a hard-core aficionado. To say he loves the stuff is a massive understatement. So it’s not really surprising that over the last month or so, our place has seen a lot of experimenting with homemade PNB. My peanut-perfectionist still has plans for further research, but I suspect it could last a life time. So I thought I’d share with you the findings thus far. So much tastier than commercial peanut butters, and without the additives. 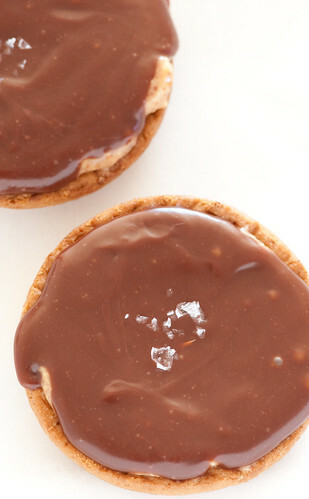 And while we’re talking PNB, I have treat for you as well in the form of super-simple little chocolate tartlets taken to a new level with a thin layer of homemade peanut butter. Sweet yet salty, smooth yet crunchy – serious adult fun. The best way to guarantee the freshest peanuts is to shell them yourself. It takes time but can be quite therapeutic, especially if you share peanut shelling over a glass or two of vino. One of our first experiments was a skins on v’s skins off competition. No question about the results, for flavour it’s skins on all the way. Not only do they add visual interest with the little flecks, they’re also adding fibre. Don’t you love it when the tastier option is also a little healthier? We had a comparison of cheap peanuts from China and peanuts from Queensland. I suspected there was going to be a difference in flavour but I can’t tell you how bland the cheaper peanut butter was. As always, you get what you pay for. Depending on the power of your food processor, you may not need to add any or all of the peanut oil. We’ve found that using a little Bamix, it just wouldn’t cope without some oil to loosen things up. Best to add a little as you go. This can be hard work on domestic motors so be careful not to put too much stress on your mixer of choice. If it is struggling, it’s a good idea to reduce the amount of peanuts in the bowl, or add a little more peanut oil. If you like your PNB super crunchy, just coarsely chop a handful of shelled peanuts and stir them through your butter at the end. Shell peanuts, keeping the skins on. Whizz until the peanuts form a thick paste, adding a little peanut oil at a time to help the mixing process. Taste and season well with sea salt. 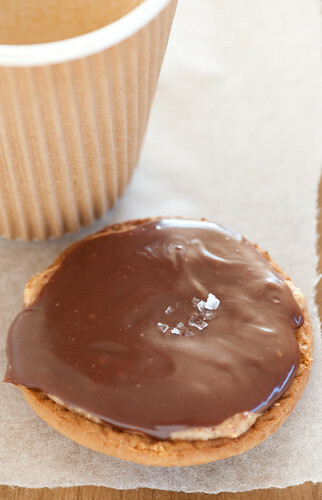 The secret to these tartlets is using milk chocolate, an idea I pinched from the boys at Bourke Street Bakery. Normally I’m a dark-chocolate-or-nothing type of girl, but with the saltiness of the peanut butter, the sweeter caramelly flavour of milk chocolate works a treat. Just don’t skimp on the quality of your chocolate. If you find your chocolate starting to ‘split’ or go all grainy, stir through a tablespoon or two of cold cream and stir vigorously until it’s smooth again – A trick I had to use recently when I was making these tartlets on the weekend. I’ve found that it takes a little bit of practice to get your tartlet-shell-forming skills honed. Expect to have a few breakages in the beginning. If you can’t get your hands on digestives, any plain sweet cookie would work. For the Aussies reading, Butternut Snaps are brilliant and a lot easier to form into shape. Bake 3 digestives for 2 minutes. Carefully, using a tea towel to protect your hand, place one digestive face down and use a soup spoon to gently bend into a shallow tartlet shell. Place on a tray to cool and repeat with remaining cookies, until you have 6 little shells. Carefully line each shell with about 1/2 teaspoon peanut butter. Place chocolate in a bowl. Bring cream to the boil and pour over the chocolate. Stir until the chocolate has melted. Spoon chocolate evenly between the prepared shells and sprinkle over a few sea salt flakes if you like. Allow to cool for a few hours until chocolate is set. If you’re short on time, chill in the refrigerator but your chocolate will loose some of it’s gloss. Why not subscribe to stonesoup by email or RSS to receive your free updates published twice a week. on breadshoes – sean’s panaroma in bondi. This is amazing! I’m in love with both the peanut butter and the little tarts! I’m off to buy some butternut snaps! Nice, thanks for sharing this I should try it soon ; love all the pics! They look and sound Delicious Jules. Very cool looking tartlets. I really like the method of bending the biscuits. PNB is so bad for you but yet so good. Yum, Jules! I’ve got a serious “thing” for PB, too! I eat it straight from the jar. Must try this. I’ve made peanut butter before, and always with the skins on because they were just too hard to peel after that. Do you have to blanch your peanuts? I blanched and then roasted mine for a while… My very first batch was a little too roasted but I think it tasted fine. I also add a little sugar to my PB because our family is (sadly) used to Skippy brand, which has sugar added. Oh dear, my winter wardrobe is going to get a battering on the waist line. These look completely delicious. 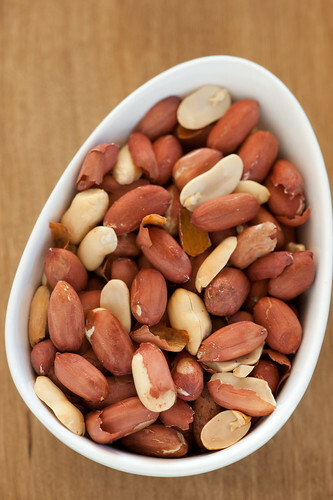 Quick question – do you buy roasted peanuts in shells, or roast them yourself? And if so, how do you roast them – time/temp etc.. willing to give it a shot but would like a bit of guidance if possible. Argh – another great recipe – this time for a substance banned in our household (2 people who can race each other through jars of PB by using only a spoon need to place some limits…). I like the idea of making just enough for something though!!! That must be allowed!!! And who would have thought tarts!! We did try and be healthy for a while and would mash macadamias, cashews, roasted almonds or brazils to make a paste that was not nearly as addictive as PB!!!! I love peanut butter so much I could make up a song…. I usually buy peanut butter at health shops, and always go for organic PB with nothing added; I will try making my own, and I will definitely try the tartlets. Thanks for the tip on how to form shells out of biscuits! Hey Jules, digestives are not easy to find here in the States. What would be an acceptable substitute? BTW, your site is on the short-list I gave my newly-on-her-own daughter – easy enough for a begginner , with loads of flavor and style. Don’t ever stop! Graham cracker! The story I heard is that when McVites wanted to bring Digestive biscuits in to the USA the powers that be said they couldn’t call the Digestive biscuits because they had nothing to do with digestion. So they called them graham crackers instead. I don’t know if there is any truth in that tale. I grew up in the USA and ate plenty of graham crackers and now I live in Australia where you can’t find them. The best approximation for graham crackers that I have found in Australia is Digestive biscuits. good question – anything that is plain and sweet will work. The pepperidge farm oatmeal cookies or sugar cookies would be good. would love to hear your PB song – cute. Love the idea to try other nut butters. am sure you have access to the good chinese peanuts and we just get the not so great ones here in australia. no I haven’t been blanching – just roasting in the shell. and I should have mentioned that you can add sugar if you like – it’s all about customising to individual tastes – absolutely nothing wrong with that! oooh these sound positively delighful!!! I must try a batch ASAP! Now I just have to work out how to use a GF biscuit base instead…..
Lovely as always! I have to agree with your Irishman, nothing trumps peanut butter and chocolate! Thank you again for beautiful images and a matching recipe! How long do you think the PNB would keep? Could you make a batch and keep it in a jar like regular PNB? omg. how have i lived this long without your blog?? i LOVE cooking (and eating, of course) and this is getting me so excited for all my future dinners. especially your vegetarian month because i am forever stumped when it comes to delicious meat-free dishes. yay! This is so beautiful. There’s nothing I love more than food that is simple to prepare yet beautiful looking and tasty. I’m looking forward to sharing this with my baking group next week. A friend and I made peanut butter and then the tarts. 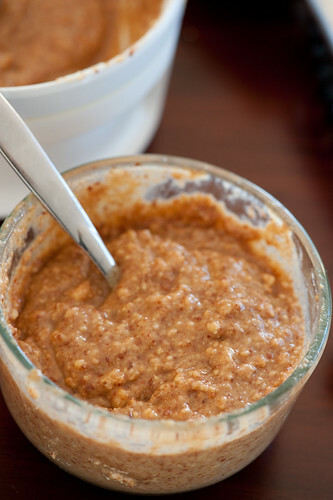 We added a few tablespoons of honey to the peanut butter and it was even more delicious! Couldn’t quite get the cookies to form so we just left them flat and it worked out pretty well. Made a little too much chocolate so we dipped cherries into it! Two treats for the price of one! Pictures on my blog soon everythingelise.wordpress.com. Thanks! This is making me salivate! Where do you buy your peanuts from? the tarts are delicious without the peanuts as well. just a little salt on the chocolate and you’re in for a treat. We’ve just been getting them from our local supermarket but on the lookout for alternatives. I’ve found homemade and natural PNB lasts for ages without going rancid; the oil naturaly floats to the top which probably offers some protection but you have to give it a good stir if you haven’t used it for awhile. How good do these look? I could eat about 100 of them I reckon! the length of time your PNB lasts really depends on how fresh your peanuts were before you made it. I was looking for a peanut butter recipe and i came here! I’m from Greece and i’ve never run across peanut oil! Is there something else that we can use! Some other kind of oil perhaps? Any neutral flavoured oil will be fine. You just want it to get the texture right. The peanut oil I use doesn’t have much flavour. I go to the health food store for my peanut butter. They put peanuts in the top of their machine. Grind, grind, grind. Peanut butter comes out the bottom. 100% peanuts. No added salt, sugar, oil or anything. I’ve never asked where their peanuts come from. Next time I will. When I get home, I put the PB in the refrigerator and it lasts until I finish it in a couple of weeks.